Batch processing remains an important tool in helping you make better decisions on how to run your business. 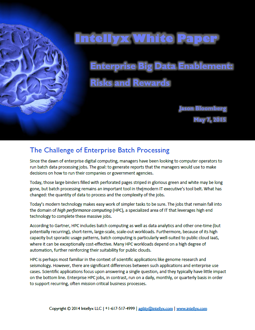 However, with the increasing quanitity of data to process and the complexity of the jobs, many enterprises face the challenge of ballooning infrastructure costs when it comes to High Performance Computing. Because of its high capacity but sporadic usage patterns, batch computing is particularly well-suited to public cloud IaaS, where it can be exceptionally cost-effective. Many HPC workloads depend on a high degree of automation, further reinforcing their suitability for public clouds. Download our white paper to learn more about why many organizations are now turning to the public cloud to address their HPC batch job needs.